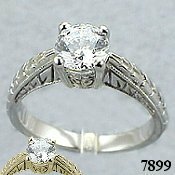 ANTIQUE/DECO STYLE SOLITAIRE ENGAGEMENT RING... 1 CARAT RUSSIAN CZ....14K WHITE GOLD.... Reproduced with Beautiful, Hand-Crafted, top quality Jewelry workmanship!!!.... Hand milled edges, Incredibly detailed !!! (These Russian CZs are more precisely cut & polished from the finest quality CZs). One of our nicest rings!!! Satisfaction Guarantee!! Picture does not do justice to this piece! Made to order, takes 1-2 weeks.